Trucks carrying six large beer vats made it to their final destination at a Toronto brewery on Monday. 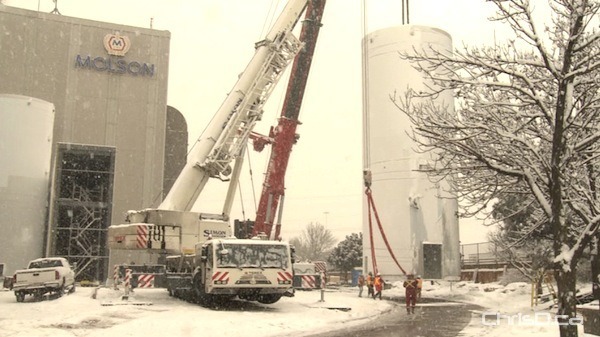 The tanks, which hold 1.4 million bottles of beer each, will be installed at the Molson Coors brewery. The convoy of trucks have been on quite the journey, after leaving Port of Hamilton on January 7 and travelling on back roads. What was originally scheduled to be a four-day trip took much longer after snags along the way. Snow, cold temperatures and a tangled mess with some hydro wires, delayed the trip. The vats are 45 metres long, eight metres high and more than seven metres wide and needed to be transported slowly — at about 5 km/h. The new equipment will increase the capacity at Molson’s Toronto brewery by 20 percent. Molson Coors spent $24 million to purchase and transport the vats from a German company.